The Guatemalan Highlands offers the perfect combination of natural beauties, spectacular mountain landscapes and traditions of Mayan culture. The most deeply rooted indigenous culture is in the Altiplano. Its pine forests and active volcanoes allow the practice of hiking, canoping and ecotourism. The western region provides a folkloric display that unites pre-Columbian cosmogony with the ways of the conquistadors. It is a perfect combination of natural beauties such as Lake Atitlan and traditions such as the Chichicastenango market, famous for its colourful. The representation of millenary traditions and experiences of Mayan peoples are reflected in every habit inherited from the region’s ancestral diversity. It also presents various options for meeting with the communities. It is the ideal space to enjoy cultural diversity, to learn languages and traditions. It promises visitors a unique experience. In the area of the Guatemalan highlands we can find different destinations in the different departments included in this region. It is located 145 kms from Guatemala City in the department of Quiché, the meaning of its name is “place of Nettles”, was founded by Quichés fleeing the destruction of Utatlán. They settled in the vicinity of Chaviar, Kackchiquel commercial Emporium. It is the center of the town and the commercial life of the “Maxeños” (the name given to the inhabitants of Chichicastenango, derived from Max, which means Tomás in the Quiché language). The merchants come down on Thursdays and Sundays, to the central square to sell their items, in an impressive indigenous market, which has little varied for centuries. In this location we will find the church of Santo Tomás built in 1540 on archaeological remains of a pre-Hispanic temple, which represents a splendid example of colonial architecture. The indigenous and Ladino rites are mixed in the suburbs and inside. Its 18-tier staircase is of importance for the practice of indigenous rituals, by Chuchkajau Mayan priests, who pray and burn corn cobs full of copal. Inside, whole families kneel and pray before the altars, loaded with candles, candle-makers, flower offerings, alcohol and in some cases food. We will also find the Calvary of the Buried Lord, his architecture presents characteristics similar to those of the churches of the Altiplano. In its stands, the soothsayers gather to give solace to the “Maxeños” Cerro Pascual Abaj also known as “Turcaj”. It’s one of the many elevations of Chichicastenango. In this place there are religious manifestations of profound tradition: ceremonies and ancestral rites dedicated to Pascual Abaj (stone deity), in which Spanish Catholicism and ancestral Mayan religiosity are founded. Lake Atitlan, located in the Department of Sololá is considered one of the most beautiful in the world by the famous writer Aldous Huxley. The lake is 144 kms. of Guatemala City and is, without a doubt, the most important natural attraction of Sololá and one of the best known in Guatemala. Three spectacular volcanoes, Tolimán, Atitlán and San Pedro, form the natural frame of the Iago. It has an area of 125 square kilometers and is located at 1.560 meters above sea level. The lake complements its beauty with scenic roads, beaches, riverside villages, mountains and volcanoes. It offers excellent opportunities to develop sport fishing, sailing, kayaking, free flight, water skiing and naturalistic recreation, as well as visiting the Mayan populations of the area. Considered the “most beautiful lake in the world” according to National Geographic and the British writer Aldous Huxley, it is located in the Department of Sololá. The word “Atitlán” comes from the combination of two Nahuatl words, “Atl” meaning water, and “Titlán” meaning “between”, so it is interpreted as “between the waters”. It is surrounded by three spectacular volcanoes that are the Tolimán, Atitlán and San Pedro, which together form a unique setting in the sunsets and sunrises. The lake is surrounded by different towns that are: Panajachel, Santa Catarina Palopó, San Antonio Polopó, San Lucas Tolimán, Santa Cruz, San Pablo, San Marcos, Santiago Atitlan, San Juan and San Pedro; Each one of them offers different experiences to the tourist through its culture and traditions. Lake Atitlan offers various activities such as kayaking, free flight, water skiing and boat trip, as well as visiting the Mayan populations of the area. The lake is surrounded by a legend that brings Misciticismo to its beauty and is known as the “Legend of the Xocomil” and is that until today from five in the afternoon you begin to feel a wind that does not allow navigation by the lake. According to the inhabitants of the area, legend has it that a maiden named Citlatzin, fell in love with a commoner named Tzilmiztli, and being a forbidden relationship and not being able to be together, they decided to sink into the depths of the rivers. When this happened, the waters mingled furiously mixed by the wind and so the beautiful lake was formed. This museum is a space to know the Sub-aquatic Mayan Archaeology, consists of a room dedicated to Samabaj, Mayan city lost under the water of the Lake Atitlan basin. In this Hall are exhibited some archaeological pieces found on the site, a model of the city discovered, as well as photographic murals of the place, which decorate the walls. With this visit, the spectator can feel as if he/she is in the own place, because the room is a set that transports it virtually to the underwater site. The Living Museum of Indigenous Culture of the Department of Sololá is a unique and innovative concept that leads the visitor in a live cultural experience, to learn about the typical costumes of the municipalities of the department, customs and traditions of The three ethnic groups in the region: Kaqchikel, Tz’utujil and K’iche ‘. One observes how a woman Atiteca is placed her tocoyal of 20 meters of length, or how a woman Sololateca places her baby in the back with Sute, among other representations of the real life of the Sololatecos. Municipalities linked/related to the museum: all the Department: Sololá, Panajachel, San José Chacayá, Santa Lucía Utatlán, Concepción, San Andrés Semetabaj, Santa Catarina Palopó, San Antonio Palopó, Santa Cruz La Laguna, Santa Catarina Ixtahuacán, Nahualá, Santa Maria Visitation, Santa Clara la Laguna, San Pablo la Laguna, San Marcos la Laguna, San Juan la Laguna, San Pedro la Laguna, Santiago Atitlán, San Lucas Tolimán. Located in the Department of Sololá, the Ixchel Art Gallery features an exhibition of paintings by local and national artists where Enrique Anleu Díaz excels, as well as traditional wood carving masks and typical textiles. Within the collection of 120 pieces are 60 paintings and 60 pieces of Guatemalan handicrafts, some are on sale and others can appreciate them in the facilities that have a capacity to attend groups of up to 20 people. History: The Ixchel Gallery emerged in the year 2000 with the aim of motivating and creating a space for the Guatemalan and mainly local artists, where they could expose their art. Another motivation for the founder of this gallery, Dr. Gerardo Barreno Anleu, was the promotion of art and the creation of a cultural and artistic activity to enrich the celebration of the patron Fair of Panajachel that takes place in the month of October. Hours of service: Monday to Saturday from 9:00 to 13:00 hours and from 15:00 to 18:00 hours. Located in Panajachel, Sololá, at Casa Cakchiquel there is a museum and art gallery with exhibition of historical photographs and postcards from the years 1.861 to 1928. As well as exhibition of paintings by local and national artists. It also works as a space for social and cultural events. Located in what one day was one of the first hotels on the lake. Casa Cakchiquel was built in 1948 and was one of the first hotels on the lake that hosted personalities such as Commander Ernesto Ché Guevara, Ingrid Bergman and other intellectuals, artists, painters and writers who enjoyed the house in their golden years. You can access by walking on the street (Avenida) Santander 300 meters approximately, until you reach the 14th Street of February on the left side. Cross and advance 20 meters more until you reach Casa Cakchiquel which is on the left side. It is considered today, as the second in importance for its size, trade and colonial style. It is called Quetzaltenango by the real title of Don Francisco Izquín Nehaíb in 1558 and on the other hand the K’iche ‘ is gave to this place the name of Xelahuh and Xelahúh Queh (place of the ten deer). Located in an extensive valley surrounded by hills and volcanoes: Santa Maria, Santiaguito (one of the three active volcanoes in the country), Cerro Quemada, Siete Orejas, Chicabal and Lacandon, offering multiple opportunities for mountaineering and hiking. These invite you to enjoy the wonderful nature and admire from their viewpoints a beautiful panorama of the city of Quetzaltenango, like the Hill Zunil, Zunilito, the tortoise and the trunk. 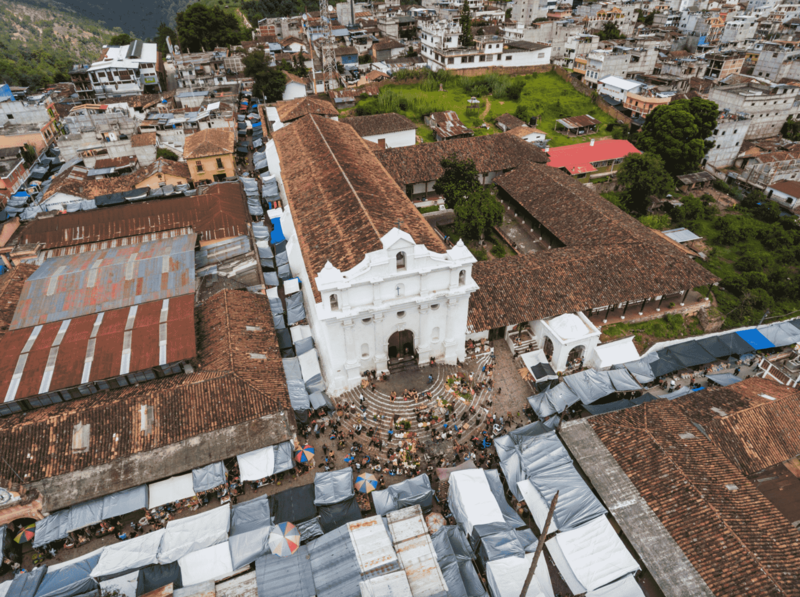 It is one of the most important cities in Guatemala because of its size, industrial activity, especially textiles, liquor, culture and its strategic location for trade. In its local gastronomy are appreciated the paches of potato, the tamales of Cambray and the Rompopo. There are several festivals in which you can attend traditional dances and dances, such as Easter, the Independence Fair, the Central American Fair or the patron Fair in honor of the Virgin of the Rosary. Within the religious field, in Salcajá is the “Hermitage of La Concepción”, a national monument and recognized worldwide for being the headquarters of the first Catholic Church founded in Central America. It possesses an imposing parochial temple of spectacular facade, is representative of the colorful and design of the local Huipil where the population venerates to Maximon, popular character of deep rooting. Located 12 kms from Totonicapán, it has a richly ornamented temple and convent, with altarpieces from the 17th and 18th centuries. Textile Producer Center, famous for the great quality of ponchos (woolen blankets) Momostecos, which are produced there. They still use the 260-day Mayan calendar. Momostenango means “City of the Altars”. Nearby are the famous cliffs of Momostenango, capricious erosions carved by eroded. Located in San Rafael Pie de la Cuesta, at 268 km. Of the capital city, by the Panamerican Highway, passing through the departmental headwaters of San Marcos. The total route of the park is done in four hours, by trails, has natural bridges, during the visit is asked not to provoke sounds that can scare away our bird symbol “El Quetzal”. In the municipal jurisdiction of Quetzaltenango. The highest elevation to the north of the crater is 2.500 M.A.S.L. and is located at the edge of the skirt of the Santa Maria volcano about eleven kilometers from the city of Quetzaltenango, where the route begins. It starts from the municipality of Sibinal, towards the north, to ascend by the Sierra de Sibinal, then to reach Hacienditas, the Pila, paddocks and Laguna Seca (place of Camp), at the foot of the volcanic cone. And then in 40 minutes you reach the crater or summit of the volcano Tacaná of 4.093 M.A.S.L. (nine Hours of ascent). From the Finca Navidad, located south of the volcanic massif, passing through the Parajetojqulan Grande, towards the summit, on the side of Guatemala and advancing parallel to the border, to the north. An important fact is that in the volcano there are several sites with cave paintings, which have not been reported, but that are known by the peasants of place, as indicated these are to the north, under the main tower representing figures of Animals. Located in the San Marcos department, approximately 20 kilometres from the Mexican border. It has a height of 4.220 M.A.S.L. It is the highest volcano in Central America and the peak of Guatemala, Neva on rare occasions as in the volcano of Acatenango, is a region where large hailstorms fall. Its temperature is quite low between the months of October and February. The panorama that is seen from the top is remarkably clear, it is reached to see the volcanic cordillera, some volcanoes of El Salvador, bordering mountains with Honduras, the imposing Cuchumatanes, the Pacific Ocean and much of the Mexican territory. The volcano is located in a rich and important area, is located a very old site and in the same volcano there is a spot, known as “La Ixpituda”, where there is a rocky wall with inscriptions and paintings of great color; This point is about 300 meters away from the reef that takes us to the volcano. The routes of approach to the Tajumulco from the capital are asphalted until San Marcos, with a route of 250 kilometers, of this city to the town of San Sebastián there are approximately 18 kilometers, on the road at the entrance of the village Tuichán are travelled 5 kilometers More. It was one of the most important cities-fortresses of the Postclassic period in the Guatemalan highlands, along with the archaeological sites Gumarkaa’j in Quiché and Mixco Viejo in Chimaltenango. Iximché, which in Kaqchikel means corn tree, was the last capital of the Maya-Kaqchikel and in 1524 became the first capital of the Spanish conquistadors in Guatemala. It is located in the municipality of Tecpán, was the scene of great events, among which one can mention its separation from the Quiche Group, foundation as capital of the kingdom and dominion over its region. In the last part of its history, after having been allies of the Spaniards, it suffered its destruction and fire on the part of them; Events that give it a great historical and cultural value and position it as a place worth visiting. The pattern of distribution of buildings shows similarity with other Mayan cities located in the lowlands of peten such as the orientation and position of their main buildings in public squares, ceremonial and private, palaces, buildings Administrative and ball games. All the architectural ensembles are located on artificially level surfaces and with a clear urban outline. At present, it is a site of importance for the Mayan cosmovision where it is possible to appreciate numerous ceremonies directed by priests of different ethnic groups who come to perform them throughout the year. Taking into account this can be indicated that Iximche exemplifies the meeting of two cultures, Maya and Spanish. To guarantee its conservation, it has a management category as an archaeological park with an extension of 50 hectares. It is protected since 1964 by the Institute of Anthropology and History of Guatemala of the General Directorate of the Cultural and Natural heritage. The park is managed and protected by the Ministry of Culture and Sports. The real name of Mixco Viejo is Jilotepeque old. Located at the confluence of the departments of El Quiché, Chimaltenango and Guatemala being one of the few centers that were inhabited and functioning at the time of the Spanish conquest. The knowledge of the site is first appeared in the work “Florida reminder” of Captain Fuentes and Guzman and describes it as a citadel of military and religious character. It is possible that the site in its origins has served to control the economic aspect of the valley, because a very short distance passes the river, which in pre-Hispanic times was a way of trade for products towards what is today the area of Zacapa and Chiquimula. To get to the site you take the road that goes towards Las Verapaces, via San Juan Sacatepéquez. You reach Montufar, a small village, then continue until you reach the bridge that is on the river Pixcayá to finally reach Mixco Viejo, the distance from Guatemala city is 60 kilometers.